Saturday, October 24th, we left in the dead of midnight to make the ~5 hour drive to Philadelphia for the NERC Franklin Institute robotic combat event. Although the competition supports up to 30 pound robots, I brought only DDT and Silent Spring because robots larger than 3 pounds were prohibited from using LiPoly battery chemistry. Even still, some of the best insect-class robots in the northeast were scheduled to attend and I predicted this would be the real test before Motorama in the mid-winter 2016. 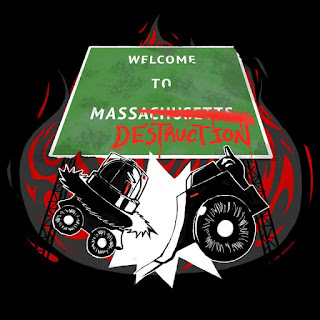 Since MASSdestruction two weeks ago, the robots received minor upgrades. DDT at minimum received a replacement motor can and pulley since the last one was actually bent from years of abuse. 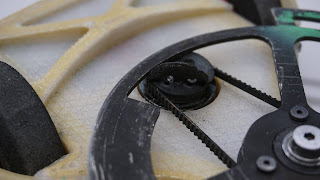 DDT was also set to receive a new frame printed with carbon fiber instead of kevlar as the tension member because it was noted that the weapon shaft bore began to open up from all the spinner-spinner hits. Unfortunately, the prints failed due to some trickiness in the CF thread and I whipped up a quick solution using two belleville washers on either side of the frame to distribute loads more effectively. Silent Spring felt the success of the upgraded drivetrain but suffered some difficulties in the tournament due to the scarcity of the choice motors. Now Silent Spring will run a OEM option, the Pololu 9.7:1 HP gearmotors. The leftover weight was spent to upgrade the disk. Thin sections that bent at MASS-D were beefed up which brought the disk weight up by 4 oz to about 16 oz. For an added bit of fun, I decided to use some voodoo magic from the robot gods in this new disk. We were clearing out the crate where Overhaul lives and I decided to pull out the AR400 plates we salvaged at BattleBots off Witch Doctor. While one plate was pretty well bent by Nightmare, the other was relatively flat which made it a fine candidate for a blade. I never did get that green color palette from Mike so I ran it in AR plate's natural color: rust. At 7:45 am we arrived in the museum and grabbed whatever tables were left. The arena was HUGE and pretty awesome in construction. Double doors for entry and exit, a nice kick plate, and great visibility all around. It left me wishing I brought the 12 and 30. I was feeling pretty good about Silent Spring's destructive capability after MASSdestruction but utilization of that power ended up being its undoing. The unevenness of the floor and massive gyroscopic forces at high speeds meant that stability was low and its first two opponents took full advantage of that. Luckily, enough, Silent Spring was able to survive those outcomes and climb its way through the bracket. Silent Spring clawed its way through the loser's bracket to find 2nd place in a 5-2 record, losing in the finals to Speed Wedge 3, an extremely robust opponent. Silent Spring definitely managed to bring the pain just as he had at MASSdestruction. Below are some pictures of opponents after matches. However, the robots didnt escape unscathed either. DDT lost a rear corner screw when Saifu clipped the edge during a gyro dance but otherwise remained unchanged. Silent Spring suffered a fair amount of injuries from the first two matches and managed to keep it together for the rest of the tournament. In its first match vs Mondo Bizzaro, SS took a blow to the wheel axle which bent the shaft (and made the disk angle weird) but also seems to have seized up a motor. This caused one of the Vextrollers to fail and I ultimately had to use a postponement to replace the drive electronics. 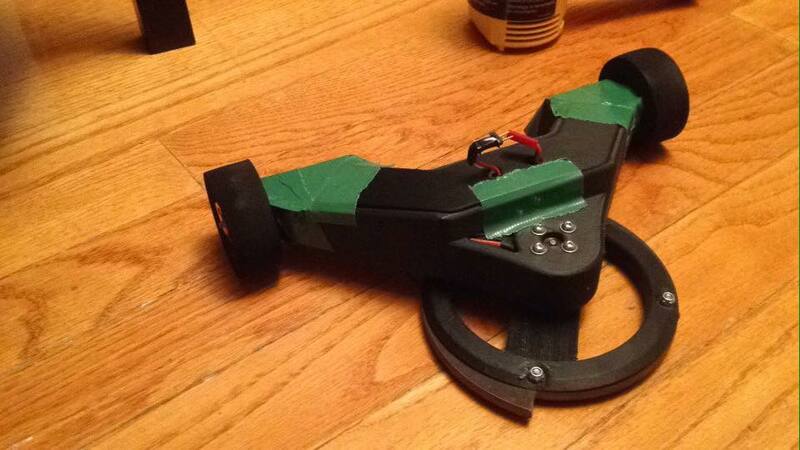 But it was the bent axle that proved to be the biggest issue going into the second match vs Project Darkness. Because it was slightly bent, the disk was no longer planar and so I could not spin up without tilting. Ian is an expert driver (in fact he won best driver award!) and took full advantage of this; he drove around SS while it was uncontrollable and delivered some nice hits deep in the UHMW back and got some nice shots on the drive pulleys which ironically bent the OTHER side's drive shaft. One of these hits actually snapped the wheel hub but somehow continued to drive just fine. I dont remember exactly how the match played out, but in the end PD was the victor and SS had to climb through the losers bracket for a second shot. When I was servicing both bent axles I managed to find a sweet spot where the blade was once again flat. Pretty much "OMG DONT TOUCH IT EVER". In its battered state, it was able to deliver the big hits and crawl back up to the finals without accumulating extra damage. DDT can continue to compete as is but Silent Spring needs significant repairs to bring it back to a reliable state. Since it keeps doing so well, I must once again delay its retirement even though I want to build something else. I'll assess the extent of upgrades to be received in time for the next competition, MASSdestruction, in December. See you all there!